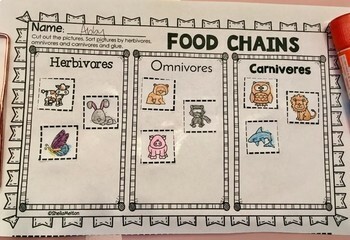 Help your students take a bite out of FOOD CHAINS with this unit including 2 Food Chain activities using real-life animal pictures and recording sheets! 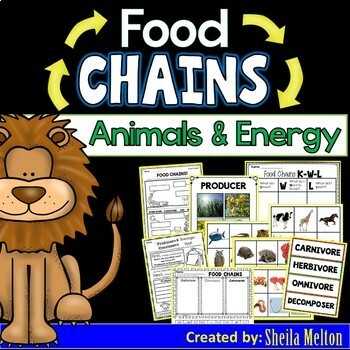 This is a great addition to your Food Chains curriculum and will add excitement and discovery to your Science Center! "SUPERB! EXCELLENT QUALITY! A MUST HAVE...GREAT PRODUCT. A LOT OF GREAT PICTURES!! Thanks, Thanks, Thanks!" "I love the real animal picture cards. There is so much you can do with this unit! Thank you!" "I loved the photographs used in making these cards. Thanks for creating such a valuable resource." "An incredible resource for my first graders. Explained in a perfect way that they all understood and got so excited for!" "This resource provided quality information, photos and activities for food chains. 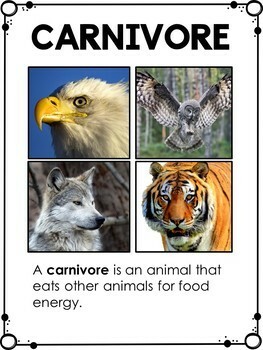 I was able to use this resource to teach about herbivore, carnivore, omnivore and decomposers. The images enhanced the lesson. The activities help tie everything together." This unit includes 6 Herbivore, 6 Carnivore, 6 Omnivore and 6 Decomposer picture cards for sorting. The picture cards come with and without animal name labels. I've also included Herbivore, Carnivore, Omnivore and Decomposer header cards to sort the pictures under. The decomposer header cards and pictures are not needed for sorting if your class does not study those. These cards are great for the Science Center! You can make the center self-checking by placing a colored dot on the back of the main sort cards and the same color dot on the back of the picture cards it corresponds to. The next activity also includes real-life animal pictures and 5 different food chains for the kids to put in order (all food chains begin with the sun). Students can then draw the food chain they created into their science journals, draw and label their food chain on the included recording sheet or glue the recording sheet into their journals. Recording sheets are also included in several versions depending on what you need. HUGE variety of ready to use printables to help you teach, reinforce, review or assess learning with your students. Includes KWL charts, ABC order, cut/paste, label the picture, notebook foldables, draw/label/describe, vocabulary science notebook foldables and fact sheets to name a few! You may also enjoy this Food Chains PowerPoint using real animal pictures. Click on the link to check it out!